We always hear that doctors have the worst hand-writing, and you can’t read anything they write, especially their prescriptions. However, this wasn’t always the case. I work for one of the oldest medical societies in America, The Medical and Chirurgical Faculty of Maryland, having been established in 1799. Back then, good handwriting was a point of pride – think about how we remember John Hancock’s signature on the Declaration of Independence. 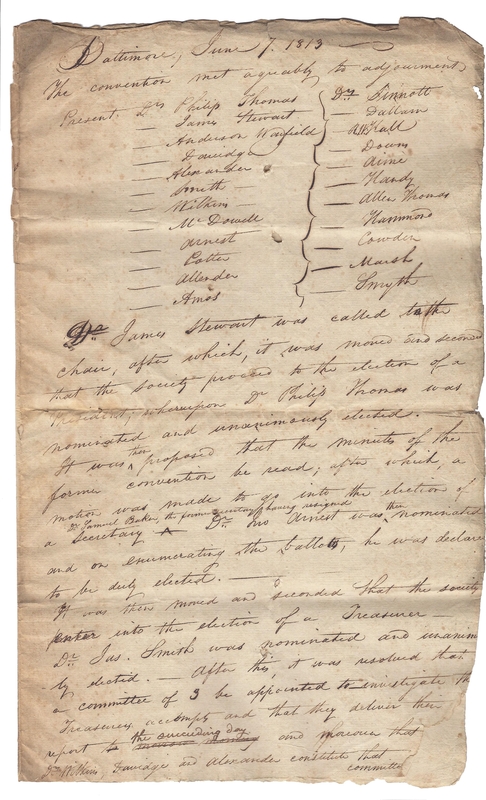 People were still writing with a quill and ink, which helped produce some of the elegant swoops and swirls in the lettering, like on this roll of the membership. 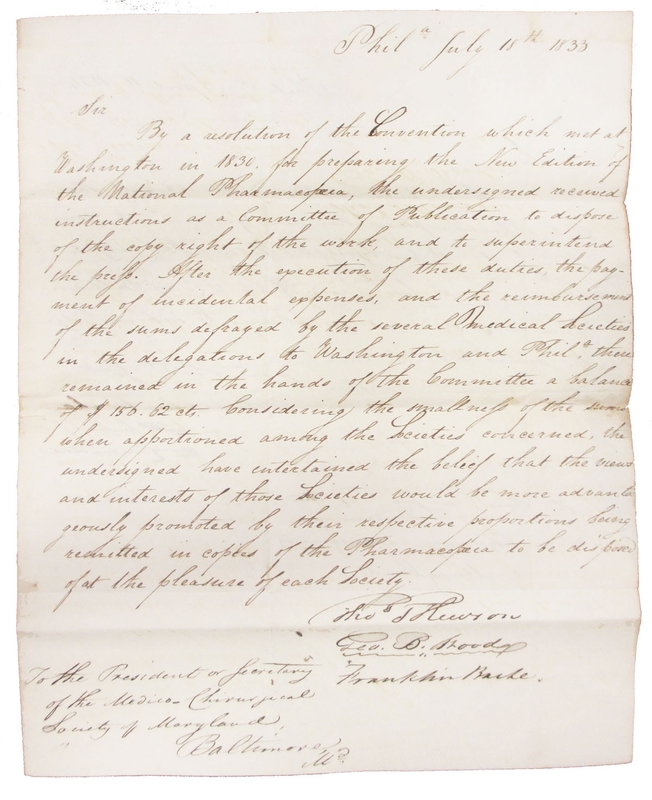 We have many of our original founding documents, most of which are hand-written, as well as ephemera spanning four centuries! Even the smallest and most insignificant pieces are done with care and flair. 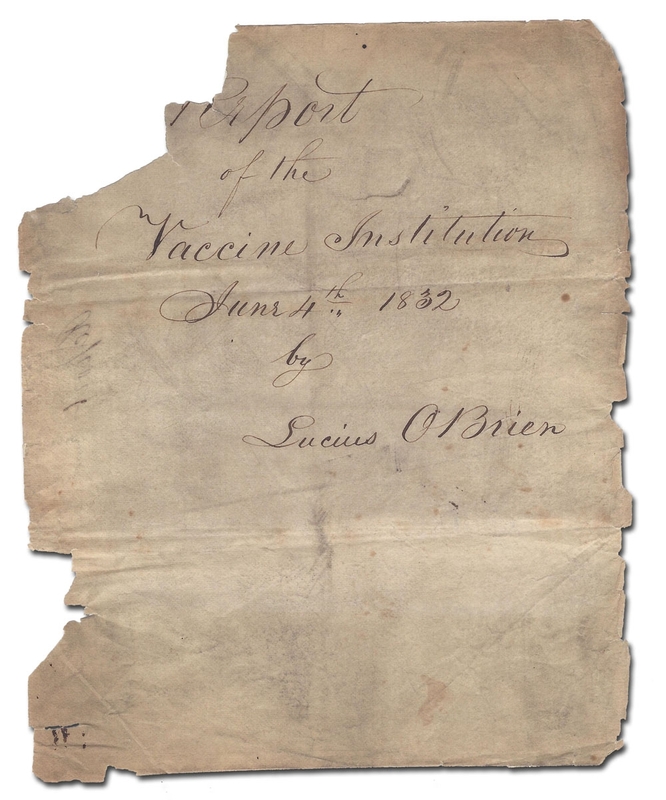 This cover of the vaccine report from 1814 has extra added serifs on the lettering. 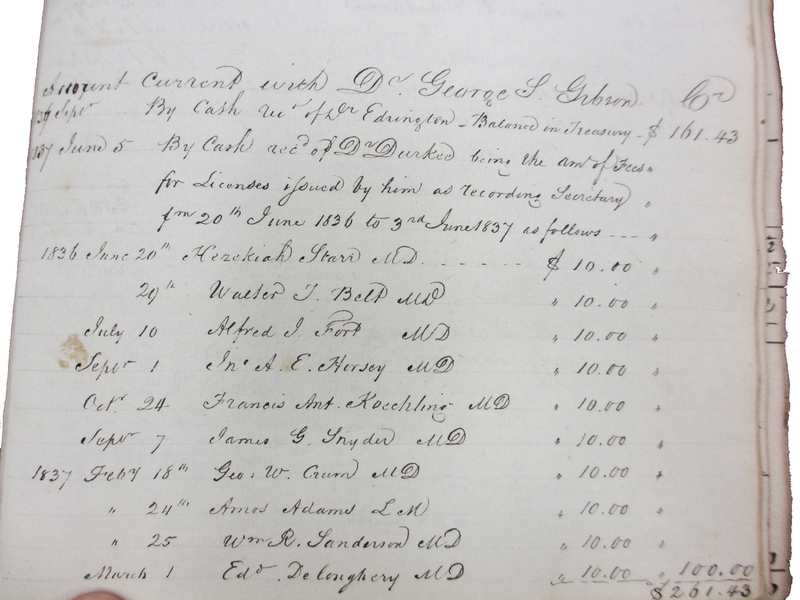 Rosters from the 1830s have names and amounts all perfectly written and the MD after each doctors’ name has a special swirl. 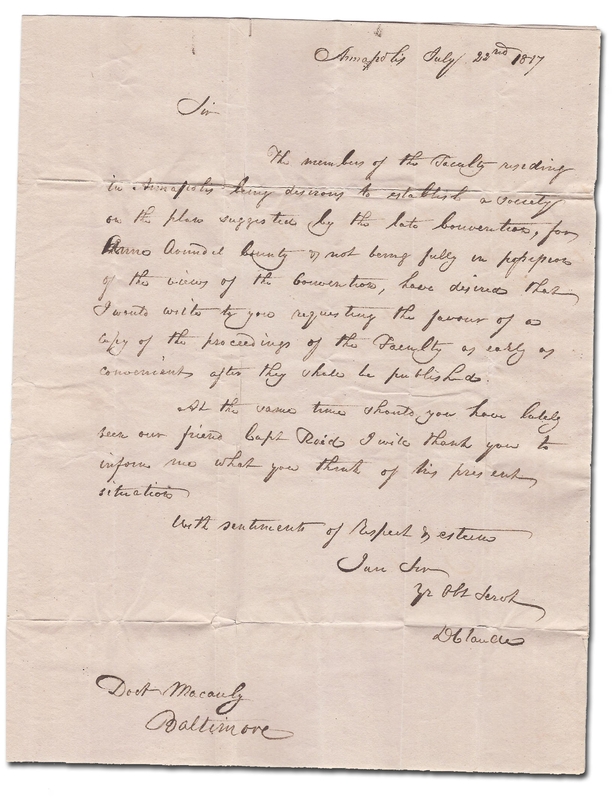 Letters to and from one doctor to another are full of formalities and are sometimes difficult to decipher, but they are fascinating to read. This letter talks about what to do with $150 remaining after a convention. The bills and receipts are also beautiful! Many of them have elaborate engravings indicating the type of business. One example of an ironsmith shows a delicate birdcage on one side of the letterhead and an iron fence on the other, showing that they are capable of everything in between the two. This elegant example from the post office is a far cry from anything you would see today at the post office! Our organization did a lot of printing – cards for the library’s massive card catalogue, pamphlets and brochures, copies of lectures and oratories, huge ledgers for the finances and the books which had been acquired, invitations and programs, and much more. The printers’ bills tout the different types of printing available – this one including printing in bronze. 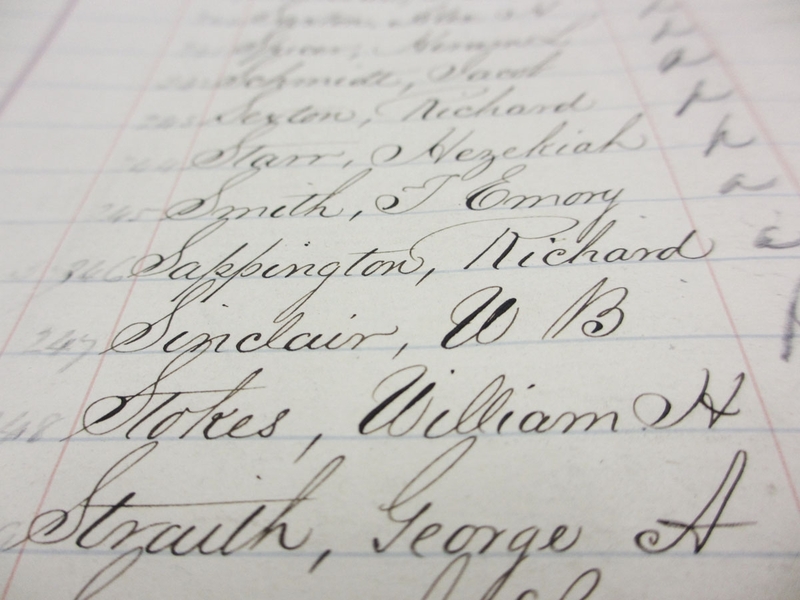 For me, the most interesting pieces in our archives have to do with one of my ancestors, Richard Spriggs Steuart, an early member of the Faculty. I stumbled across the paper nominating him to become President of the organization where I now work. 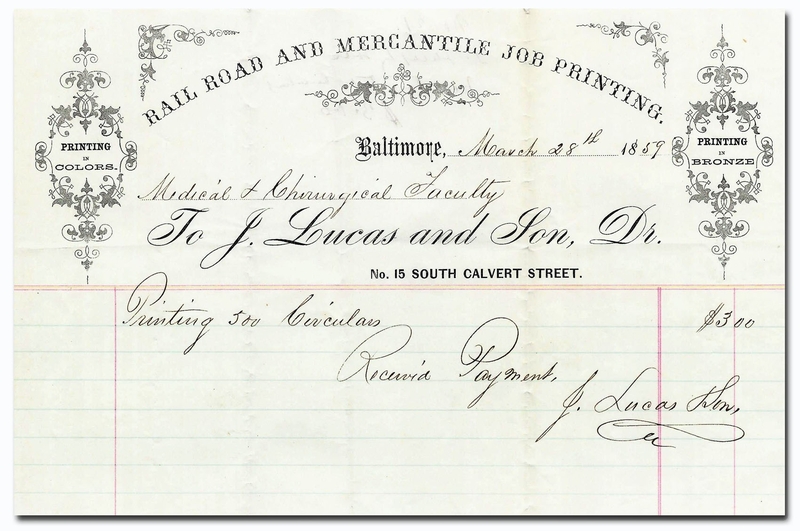 Another paper in our archives is one in which Dr. Steuart verifies that a young physician has graduated from the University of Maryland’s Medical School, founded only 20 years earlier. Finding a paper signed in his hand was very gratifying. As you move through the years, and typewriters become more common, the handwriting deteriorates somewhat, and now that we have computers, it’s almost unreadable in many cases. 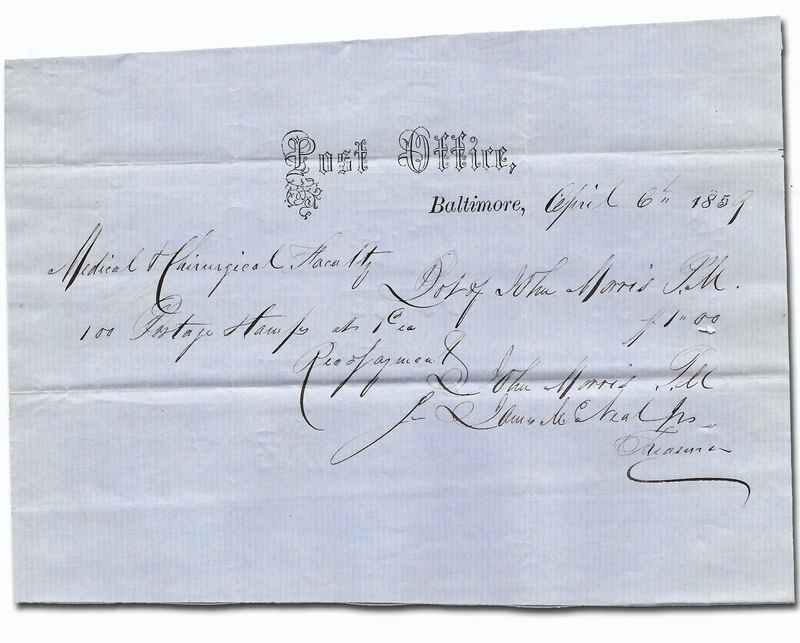 We were recently given four massive ledgers filled with prescriptions from a pharmacy in Baltimore that closed. These date back to the 1920’s and you can get a clear idea of how truly bad the handwriting is! 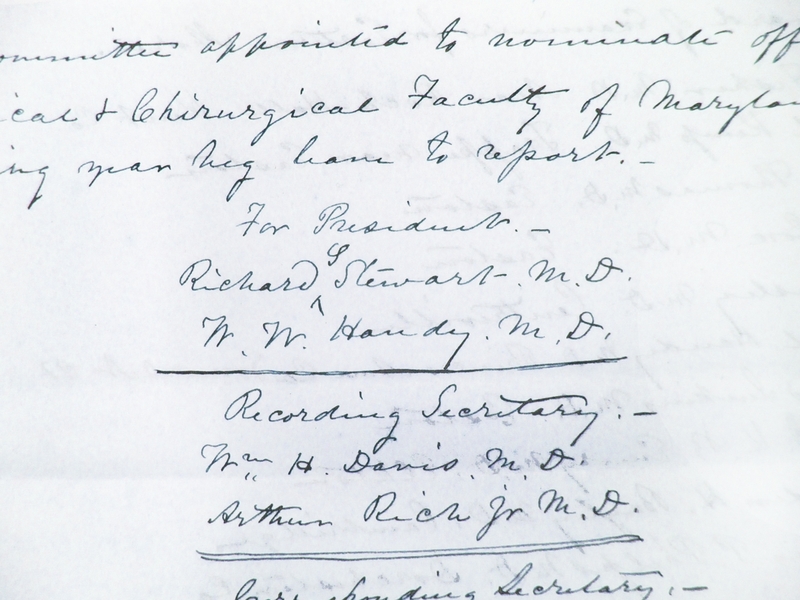 The archives at the Medical and Chirurgical Faculty of Maryland have yet to be fully investigated and researched, but from what I’ve seen, there are treasures in handwriting and in what the old documents tell us.